flushblush, I think I might keep the rest of mine to use on body, I've been using mine for a bit now and it is much harsher than I prefer. That's a great idea, @@northtosouth! I might try that. By the way, @ confirmed that the ph level of the cleanser is 7.5, which explains the harshness. Ladykin Broccoli Toner (superfood): This is just a lovely toner. Feeld good on the skin and is very moisturizing.Has a subtle and nice scent too! Happy bath Rose Shower Gel (rose scentbox): Almost smell like the Morrocan rose series from REN which I adore. It smells of fresh roses and the scent lingers quite a while. Soon done with it which is a shame..
Tonymoly Tattoo Eyebrow Pencil (kstyle 3): This has a super fine tip which makes it so easy to draw those fine "hair's" onto the brow. Lasts for a couple days if you don't remove it - which I always do. Would almost consider this my new HG brow product in conjuction with the Dipbrow pomade from ABH. A lot of people like that tonymoly brow product it seems. It really is amazing.. Looks so natural too!! I LOVE the Tony Moly brow tattoo marker. I was so nervous to try it because markers are typically too harsh, but this isn't at all, and blends out really well if you use a spooley brush. I use it every day now, and I'm definitely going to repurchase. I still use the anastasia brow wiz, but I use the brow marker to draw hairs where I don't have any. It looks way more natural than just the brow wiz alone. Dewytree Aqua Collagen Peptide Sleeping Mask - I didn't like this sleeping mask at all. While it did make my skin feel more hydrated, it broke me out like crazy! It also had a small burning sensation when you apply it on, so avoid putting it near the eye area. I love the smell of the hand cream. The cream itself isn't anything special, and I won't rebuy it, but after I use it I find myself smelling my hands. Sort of creepy, I guess. 7 Dais Medi Anti-blemish Serum- I think this is my new go to acne product. I use it more like a spot treatment than an all over serum because my breakouts tend to occur only in certain spots. Since I started using it the red marks from old breakouts have faded considerably, and it stopped what felt like a large spot brewing under my skin before it came to the surface. The fermented smell can be a bit unpleasant but it doesn't linger. It can be a bit drying on my skin, so I make sure I use something super moisturizing over top of it. Just got the Honey #53 today, and I have to admit that I can't see where this Memebox excitement comes from. I was really excited about trying this and maybe even experiencing some, "Korean Magic". Like maybe they have some ancient asian secrets, ya know? It takes forever to get a box. You order it in say August, it ships in Septemeber, and you get it in October. Tracking was a complete failure. It shows my boxes last stop was in Korea on Sept. 23. The product quality overall is poor. If I was a teenager,I would be thrilled to get this. Last night I used the conditioner and thought wow, this is a nice light one and I like it. Maybe there is ONE DECENT product in this box after all. Woke up and was like, why is my hair still wet? Not wet.... So now I have to wash it again before I dye it like planned. Heck before I can even go out to the store to buy the dye. May need to use my husbands cheap but strong shampoo. I can't work out what went wrong with the hair treatment, I used it today and my hair feels better than it usually does, and that saying something because I use a full Kerastase routine and it's bleached to the point where it's white so it can take pastel colours. When my mum touched my hair she asked if there was enough for her to try it. I must have fat calves because I didn't experience any painful or uncomfortable feeling. It is really great for me, as I do walk a lot and my legs get so tired sometimes. I actually slather it on!! Also the steps on the website are confusing... Maybe I didn't spend long enough on each step? It was one minute one step or is the clock icon not meant to be indicating anything? hi @@athy - I didn't really follow the instructions exactly. I just massaged this cream into my legs and then my feet (around the arches) I spend a few minutes massaging it into my skin. The cooling effect does wear off after a while for me, but around 10 - 15 minutes or so. The relief on my legs lasts longer. The Rappol cream from one of the boxes has been a life saver for my daughter whose eczema flares up in winter. She's used it for a few days all over her body and her skin is calm and not itchy anymore! Not even her RX cortisone has helped this much and it's light and sinks right in vs. the heavy greasy cortisone cream! Great stuff! Skinfood Egg White Pore Meringue Foam: It dried out my naturally oily skin to the point where putting on anything moisturizing afterwards burned. I thought maybe it was the Tomato Whitening Toner, but after 3 days of switching out the cleanser, the skin on my face has stopped hurting. Skinfood Choco Eyebrow Powder Cake: I love my eyebrows, I do them everyday regardless of whether I put on any other makeup. This product was absolute junk. The powder is wayyy too powdery and the brush is too thick and firm, which makes for a very messy application. I looked like Bert the first time I used it. Even with my own eyebrow brush, it wasn't much better. The powder didn't provide enough coverage, but still managed to make a mess. So far I haven't found a K-beauty eyebrow powder that I can use for everyday natural brows. I was hopping to switch out my Benefit Browzings for something more affordable, but alas, it is not to be. Does anyone have any recommendations? I haven't tried that cleanser yet but I really want to like it... Eep! I've heard the ph is really high though. I wonder if rebalancing immediately with acid toner would help? Pls don't forget to use our REAL Product review center to also write product reviews! @@TonyaBeans Actually yes. Missha's style eye brow pencil is AMAZING! Can anyone who got the Cleanse & Tone give me a review of the Ginkgo wipes? I really want to save them for a festival in the summer, but I've come across some really rubbish wipes in my time so I don't want to be stuck in a field with something that dosent work. Does it get your eye makeup off? Does your face feel clean after? I've been using the Na. 8 Outbath Treament for a couple of weeks and it has worked wonders for my hair. The first time I tried it, I left it in overnight and planned on washing it out the next morning because I was sure it would be too heavy. It makes my hair so soft and shiny. As a point of reference, my hair is long, fine and thick and I have low lights put in to cover/camouflage the "sparkles" that keep multiplying. Have any of you ladies tried it? Do you prefer any other products we've received from Memebox? I'm a bit overwhelmed by all the products I have and it's my mission to use the items or gift them to friends and family. A couple of months ago, I purchased Skinfood’s Thermal Water Cotton Facial Sheet masks without really knowing what they really were ~ they just sounded cool. 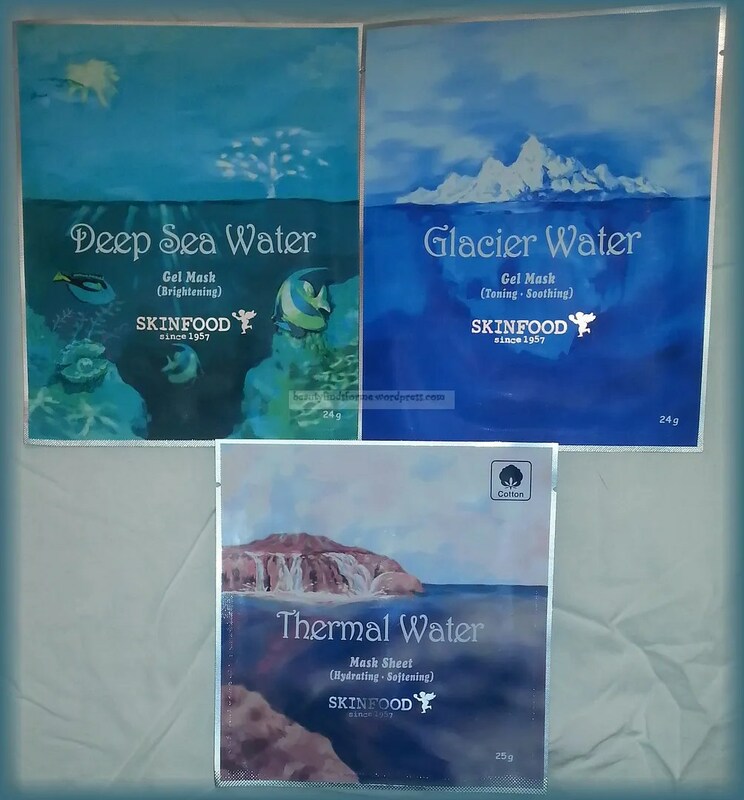 In the past few weeks, I have rounded out my Skinfood Water Collection with their Glacier and Deep Sea Water Hydo-Gel masks and I am going to review all three of them here. First, can I mention how I love the packaging? I love water and the mask package shows 3 beautiful watery scenes ~ from the earth toned heated volcanic waters in Thermal, icy and deep blue Arctic region in Glacier and the beautiful teal and green tropical aquatic life in Deep Sea. I know this is a simple thing, but the aesthetics appeal to me greatly. Thermal Water Story: Since ancient times people bathed in water from hot springs to relieve fatigue and softens skin. A cotton sheet mask that hydrates and softens skin with thermal water in a rich, moisturizing serum. 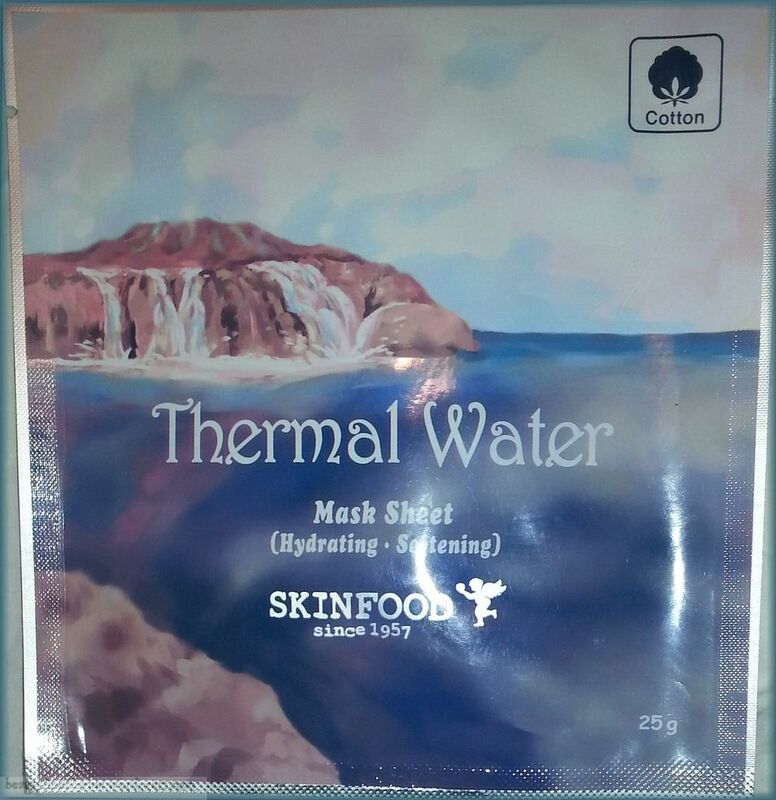 The first mask I purchased is the Thermal Water (Hydrating · Softening) mask sheet and this is my only cotton one. I actually prefer cotton sheet masks. This mask is over-sized, for sure, and it is a thick cotton mask. It has a faint scent, but nothing unpleasant. This mask is drenched with the Thermal Water essence and I actually was able to keep this mask on for 40 minutes, even though the instructions stated 10-15 minutes and it still was not dry when I removed it! My face was very hydrated, soft and moisturized…and sticky with essence. I had to pat in the essence and wait an additional 30 minutes before it was fully absorbed. I didn’t do my research when I purchased this mask so I did a little bit of it afterwards. The Skinfood Thermal Water mask is best suited for dry skin. I have oily skin and so it this was a real moisture water bomb for me. Not that I didn’t like it ~ I did. However, I plan to save these masks for those days when my face is really parched ~ maybe after shoveling snow for hours, or when I am out in the sun all day long in the summer and my face needs that extra moisture. I can recommend that if you have dry skin, you should try these out. Again, I have the cotton masks, not the hydro-gel versions. You can find these on eBay with an average price of about $2.00 ~ $4.00 apiece. I find it hard to believe that this mask only has four ingredients. I think they just are displaying the key ingredients here..
Glacier water story: Pure glacier water is naturally alkali and enriched with oxygen, potassium, calcium, magnesium and other beneficial minerals. A glacier water-infused cooling hydrogel mask keeps moisture into skin as it gradually melts over time. Glacier Water (Toning · Soothing) hydro-gel mask. I purchased these next masks at the Memeshop and I didn’t pay attention that they were gel masks, otherwise, I may not have bought them there. As I stated, I like one piece masks and most hydro-gel are two pieces. I actually did my homework before I tried this mask on!! The Glacier Water is for oily skin and sensitive skin, so this one should be perfect for me. This actually had weaves in the material of the gel and was not that heavy with essence, in my opinion. I was able to put the 2-piece mask on without issues and it fit nicely on my face ~ I have to say, Skinfood does make masks that actually fit my face with its high cheekbones and wide nose! However, it does leave the outer sides of my face a bit exposed, which isn’t an issue with this mask, as I am not oily in that region. This mask had no scent at all. The usage states to keep the mask on your face for 20-30 minutes, which I did leave on for 30 minutes. This is a very refreshing, cooling without being watery or sticky, no greasy feeling, which is due to the sodium hyaluronate ~ an effective emollient. This mask didn’t have as much essence compared to the Thermal mask, probably because it is a hydrogel mask and not a cotton one; also it is marketed as “lightweight moisture”. My skin was moisturized without being shiny ~ almost matte. I am quite pleased with this mask and think it is best suited for when my face feels really oily or in the summertime, as it is a very cooling mask. I do not recommend this mask for those with dry skin, as I think it would not be that moisturizing for that skin type. I purchased these at the USA Memeshop for $2.50 and you can also find them on eBay as well. Deep Sea water story: Pure deep sea water is naturally cool and enriched with a myriad of minerals. A deep sea water-infused cooling hydrogel mask helps purify and brighten skin as it gradually melts over time. The last mask I tried is the Deep Sea Water (Brightening) hydrogel mask ~ this design on the package is my favorite! I love the tropical waters and sea life. This is a brightening mask and I am a bit obsessed with brightening products right now. It is suitable for all skin types who wish to even and brighten their skin tone. 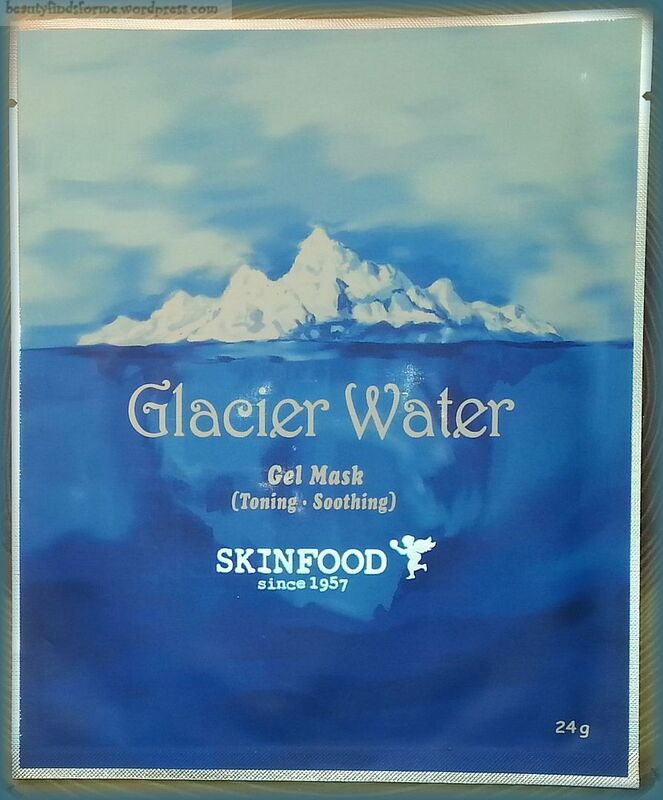 The fit of this mask is the same as the Glacier Water, a two piece hydrogel. Now, I had mentioned that the fit doesn’t quite cover my outer regions of my face, and whereas that wasn’t an issue with the Glacier Mask, it is an issue with the Deep Sea Mask. My sun damage is in that area ~ from those days where my cheeks were exposed to the sun and I have sun spots there. That is the area I want to even out my skin tone. There is no scent to the essence and I felt that this mask had more essence than the Glacier Water. This is also a cooling mask, which I think is due to the hydrogel. I do not feel that these hydrogel masks have the proper amount of essence that I am looking for in a mask. My face was refreshed and looked more vibrant. Does the mask “melt” into my skin? I don’t think it did, but I did leave it on for 30 minutes ~ recommendation is 20 – 30 minutes ~ and when I removed the mask, it wasn’t as jelly like as it was when I put it on…So, I do think my skin did absorb quite a bit of the essence. My skin is not sticky or tacky, no greasy feel afterwards. I purchased these at the USA Memeshop for $2.50 and you can also find them on eBay as well. Lesson learned ~ I still do not care for hydrogel masks, even though these Skinfood hydrogels were much more “obedient” and didn’t slide around my face that much. I have now purchased the cotton sheet masks in Glacier Water and Deep Sea Water on eBay, as I really want to compare the cotton ones next. They should be similar to the hydrogel versions, but I am hoping that they have more essence and the mask fit will be similar to the Thermal one, for better coverage. I will review them here again once I get them. I want to try all three out because Skinfood makes a toner in the Thermal-Glacier-Deep Sea Water series. I wish to pick the appropriate one, which will either be Glacier or Deep Sea and I need to really compare them in the cotton mask version to get a good feel of the essence. Thermal Water: A water-moisture bomb. If you have dry skin or just need to hydrate your skin quickly, this is the mask for you. Glacier Water: A cooling, refreshing mask for oily and sensitive skin types. It will hydrate your skin without feeling sticky or greasy. 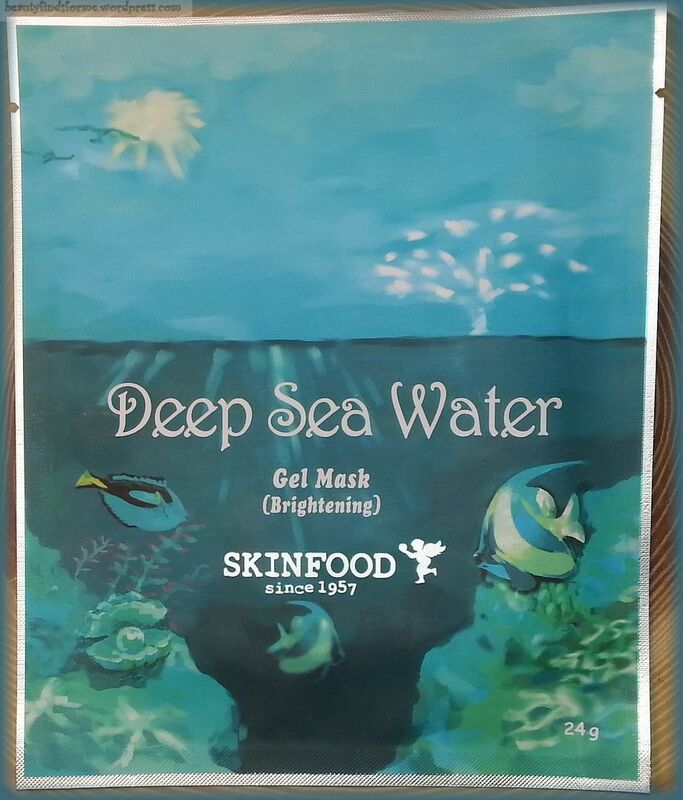 Deep Sea Water: A brightening mask for all skin types who want to brighten and even out their skin tone.